In Hawaii all operators of personal watercraft (PWC), also known as 'thrill craft', are required to have proof of successful completion of a state-approved boating safety course. The BOATERexam.com® online boating safety course meets this requirement. The State of Hawaii honours a reciprocity agreement with other States. A person who is certified to operate a PWC in another state may legally operate a PWC in Hawaii. 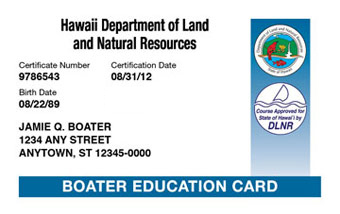 However, the certification must have been issued through a National Association of Boating Law Administrators approved course and the operator must complete the portions of a certificate course for Hawaii that includes, but is not limited to: (1) Local ocean safety principles and practices; (2) The historical, cultural, and customary practices of Hawaii's ocean users; and (3) Any rules or laws pertaining to protected species and thrill craft operation in the State. No person under the age of 15 is permitted to operate any PWC (thrill craft) on the waters of Hawaii. All children under the age of 13 are required to wear a U.S. Coast Guard Approved PFD at all times while the vessel is underway unless they are below deck or in an enclosed cabin of a boat that is at least 19 feet in length. The online boating safety course covers a wide range of operating laws in Hawaii. For a complete listing of Hawaii's boat operating rules and regulations, please consult the Hawaii DOBOR website at the Hawaii DOBOR .